Prototype Or Experimental ARVN Rucksack? Last month, we bought a strange rucksack that we have never seen from a British seller. 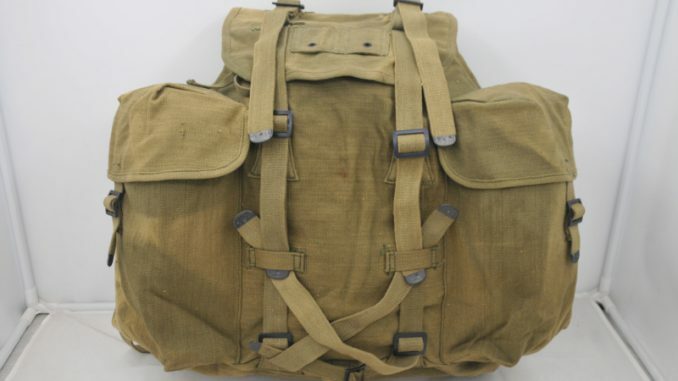 It seems like a copy of 1950’s French Army LAFUMA Rucksack. But when we get our hands on it, we found that it had a high possibility to be one of the prototype or experimental of the ARVN Rucksack. Let’s have a look at it. This rucksack kept those main features of original French rucksack very well: Steel cross bar pack frame learnt from German “A-Frame” used in WWII; Main compartment with drawing cord; Two large outer pockets; White blank name plate sewn on the back bottom; Lashing straps on both sides and flap, etc.It’s worth mentioning that all the leather parts on the original French rucksack were replaced by canvas made part. We may think it as a low-cost version of a French rucksack. As we have mentioned before, there are many similarities but still there are differences between this item and previous products as well, and more important, these differences all matched the ARVN rucksack very well. Let’s check it out. Firstly, the mounting panel sewen on the flap is obviously designed for the slide keeper which used in the M-1956 system. There is also a pair of M-1910 hanging eyelet on this mount panel which means it can be attached by any U.S. military standard attachment. On the front center bottom there sewn a fixing strap. We consider that these may design for the carrying entrenching tool because of the same combination appeared in M-1944/45 Pack System and ARVN rucksack. But they were not showed up in original French ruck. Secondly, the metal accessories are all in U.S. specifications that you can also find in the M-1956 webbing system and other USGI gears in the same era. There is a small piece of Veclro loop pile sewn on the back of shoulder strap. The original French rucksack has leather shoulder straps, with wool mat sewn on the back. The frame was fastened by a 1cm standard snap button as same as other USGI stuff used. At last, we found it’s shoulder straps were linked to the D-rings sewn on the bottom just like ARVN rucksack did, while the original French rucksack’s straps linked to the frame bottom. There is only one stamp can be found in the main compartment, it said “63″. Maybe a meaningless serial number, lot number, or a year number stand for “1963”. Overall contrast with ARVN rucksack. As we all know, the ARVN rucksack did came from the French LAFUMA rucksack which French Army brought to Vietnam in the First Indochina War. There is a declassified report recorded by NLAB’s research on designing individual equipment for Vietnamese and Thai soldiers that was done in Southeast Asia during 1963. According this report, since the America assisted M-1945 Pack System did not fit short statured Southeast Asian soldiers very well, the US Army decided to start a research of designing a new suitable rucksack for them. In the year 1963, NATICK Lab researched several kinds of rucksack and backpack had used in Southeast Asia. The French Army LAFUMA rucksack had been chosen as an original design for the new rucksack. They used canvas replaced leather part on the original French rucksack, and rattan made pack frame replaced steel frame. Material gathering and assembling were done in local Southeast Asia. The NLAB made 12 prototype rucksacks, two reserved by ARPA, and rest ten were issued to BDQ and VNMC for field testing. The field test feedback focused on the rattan frame. It was lighter than the steel one but also vulnerable. So, they changed back to the steel frame and made a final version which is what we usually see today. Based on the records and what we currently have, this rucksack we found may be a be one of the prototype or experimental of the ARVN Rucksack that tested during 1963, which is quite possible.